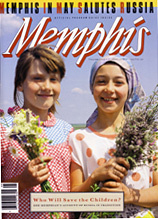 This article was published in the May 1993 issue of Memphis Magazine. 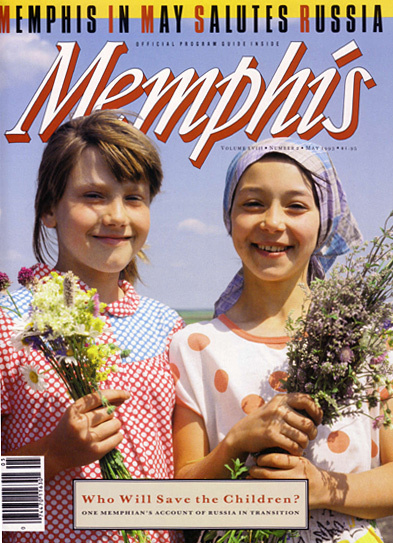 The city’s annual Memphis in May Festival salutes a different country each year, and in 1993 it was Russia. After I spent a summer volunteering at a Russian orphanage and several months studying in Moscow, the magazine asked me to paint a picture of Russian life right after the disintegration of the Soviet Union. The flights that took me from the United States to Russia first hinted at what I was leaving behind and what I was heading for. The widebody jet that took us from the U.S. to Prague offered complimentary beverages, quasi-gourmet meals, movies, and soft European music. The Czech and Slovak flight attendants spoke a lovely brand of English and endeavored to make our flight as comfortable as possible. And the restrooms on that flight were cavemous, with dispensers along one wall offering every imaginable sort of toiletry. The next flight, a jump from Prague to Bratislava, in the now Slovak Republic, squeezed us into a narrower jet. Lunch consisted of boiled meat and boiled vegetables without the accompanying European serenade. The flight crew seemed pleasantly indifferent to our presence, and the restrooms featured small, rough, brown squares for toilet paper. The inch-thick seats aboard the Russian plane flipped completely forward whenever the plane nosed down. The final flight aboard a Russian-built jet alarmed me, but not for long, as the hot air (the air conditioner, if it existed, wasn’t working) lulled us into a languid stupor. The inch-thick, cloth-wrapped wooden seats aboard this Russian wonder flipped completely forward when the plane nosed down, sending my own nose into my neighbor’s back. The restroom effused a rather adversarial stench, and offered no paper of any kind. The flight attendants tolerated us. We didn’t complain, though. Not on the planes, and not when breakfast turned out to be fish; not even when we arrived at our Moscow hotel and found that only one shower and one toilet in the entire place worked. Not that ours was a particularly self-sacrificing group — we simply had a mission. I was one of 44 college students and recent graduates who had volunteered to live and work in orphanages throughout Russia for the summer. We had been recruited by Intemational Families and Exchanges, a non-religious, not-for-profit humanitarian aid organization based in Maine. I chose to join the program both because I love children and because I wanted to improve my Russian. Before trekking out to our orphanages, we stopped in Moscow — which struck me, on this first visit, as a city of concrete set ablaze beneath the insomniac northern June sun, which rose before 5 a.m. and didn’t set till around 10:30 p.m. The lack of cold drinks (or anything cold at all) enhanced the blur caused by this overworked sun. So I questioned the paradoxical vision of snow I beheld one day during that same month: It blew in through the windows, it covered the streets and sidewalks, and it didn’t melt. The locals call this oddity pookh, or “fluff.” Given off by female Balsam poplars in the early summer, this fuzz fills the air and pads the earth in what looks like a wondrous summer blizzard. 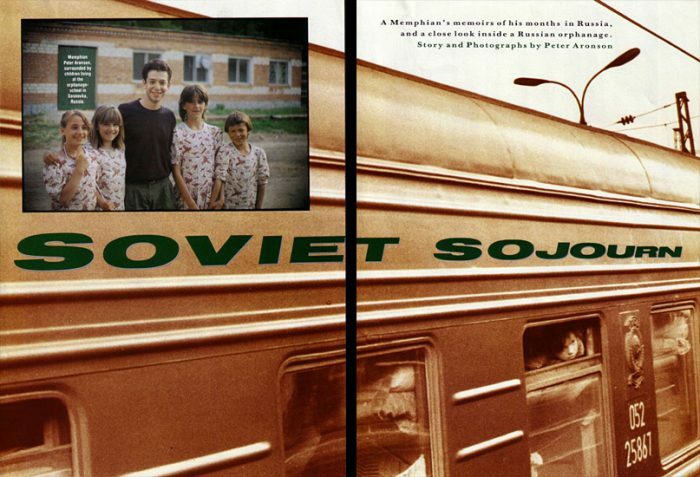 After resting a night in Moscow, we boarded a train at Moscow’s Paveletsky Station, and I was about to embark on the first of many memorable Russian train trips.